Join The Hug! Moonhug Invites the Public to Send Memories and Wishes to the Moon. The Moonhug project, led by Tzili Charney from Israel, and the American nonprofit, the Arch Mission Foundation, will grant everyone the opportunity to send their memories to the moon. An innovative and historic project named #Moonhug (www.jointhehug.com), led by Tzili Charney from Israel, founder of the Leon Charney Resolution Center, in cooperation with the the Arch Mission Foundation, will provide an opportunity for anyone to land their personal memories to the Moon. The first test of Moonhug was conducted last week in the SpaceIL Beresheet spacecraft, which carried a time-capsule containing 30 million pages, as well as the personal memories and photos of thousands of people - etched into special nickel discs that last up to billions of years. By registering at jointhehug.com people will be invited to send their personal memories to the Moon, where they will be preserved for generations to come. Participants will be able to send pictures, personal writings, and even short videos and voice recordings, as part of the Moonhug initiative. The Arch Mission Foundation has already announced plans to deliver additional installments of the Lunar Library over a series of upcoming Lunar landings by multiple space companies. Moonhug content will fly inside the Lunar Library on these upcoming missions. The Moonhug content will be added to Lunar Library, which will fly in the Israeli spacecraft "Beresheet 2” and that is set to be launched to the Moon in the coming years. It will also be presented to a number of leading museums around the world. The original logo for the #Moonhug project was created by the Israeli artist, Zoya Cherkassky. The Lunar Library and the Billion-Year Archive are unprecedented in scale. They are curated by the Arch Mission Foundation in order to backup Earth. The Lunar Library contains more than 30 million pages of history, and is designed to last at least a billion years. It includes human knowledge and history from different civilizations, covering all subjects, cultures, nations, languages, genres, and time periods. The first installment of the Lunar Library was in the SpaceIL Beresheet spacecraft, on 25 DVD-sized discs containing 200 GB of information, consisting of 30,000 books, a key to 5,000 languages, plus a copy of the English Wikipedia. In spite of the failed landing attempt, the particularly resilient design of the discs, along with the information revealed so far about the crash's intensity, reinforce the hypothesis that the Lunar Library may still be intact on the Moon. The Leon Charney Resolution Center that was founded by Tzili Charney in honor of her late husband, is a significant partner of the Arch Mission Foundation. The Moonhug project will give the general public an opportunity to take part in the Lunar Library. Charney became interested in collaborating with the Arch Mission Foundation following her meeting with founder Nova Spivack as part of the Genius 100 event in Los Cabos this winter. Tzili Charney said, "We want to bring the dream offered by the Arch Mission Foundation to every person and enable everyone to be a part of the project to send something personal to the Moon Together we can inspire everyone with this exciting initiative. Moonhug is a giant hug between the people of the world and the Moon. It will connect all people on Earth, each in their own personal way". Nova Spivack, co-founder of the Arch Mission Foundation said, “Initiatives like the Lunar Library and The Billion Year Archive are often perceived as benefitting future civilizations, but Tzili Charney understands the importance of these projects for the people of today — they unite and elevate our spirits, and give each of us inspiration, whenever we look up at the sky and gaze at the Moon". Additional details regarding the the Moonhug imitative and the Lunar Library can be accessed at www.jointhehug.com and www.archmission.org. The Leon Charney Diplomacy Program at Florida Atlantic University received the Distinguished Delegation Award at the National Model United Nations competition in New York City. Thirty FAU undergraduates joined more than 5,000 college students from 350 universities in the annual competition where schools represent countries and students step into the shoes of diplomats to solve global problems. The Leon Charney Diplomacy Program, which trains students in world affairs, dispute resolution and debate, was established in 1996 and is a unit of the Peace, Justice & Human Rights Program. To date, the program has won thirty-three national and international awards for academic excellence. In 2017, the program was named to honor the diplomatic legacy of Leon Charney, who played a key role in the 1978 Camp David Accords. FAU will next compete in Nationals in Washington, D.C. in November where it will defend its first place finish in 2018. Information about the Leon Charney Diplomacy Program can be found at www.fau.edu/diplomacy. The University of Haifa hosts largest Israeli-Palestinian student congress ever held in the region in partnership with the Charney Resolution Center. Some 150 Israeli and Palestinian university and high school students gathered on campus this week to ‘negotiate’ peaceful solutions to the Israeli–Palestinian conflict. They were greeted by President Ron Robin, Prof. Gad Barzilai, Vice Provost and Head of the International School, and Prof. Jenny Kurman, Dean of Students. Students conducted negotiation role-play simulations to build mutual trust, end violence and come up with creative solutions to the Israeli-Palestinian conflict. Dr. Sapir Handelman, winner of the prestigious Peter Baker Prize for Peace and Conflict Research, led the discussions. 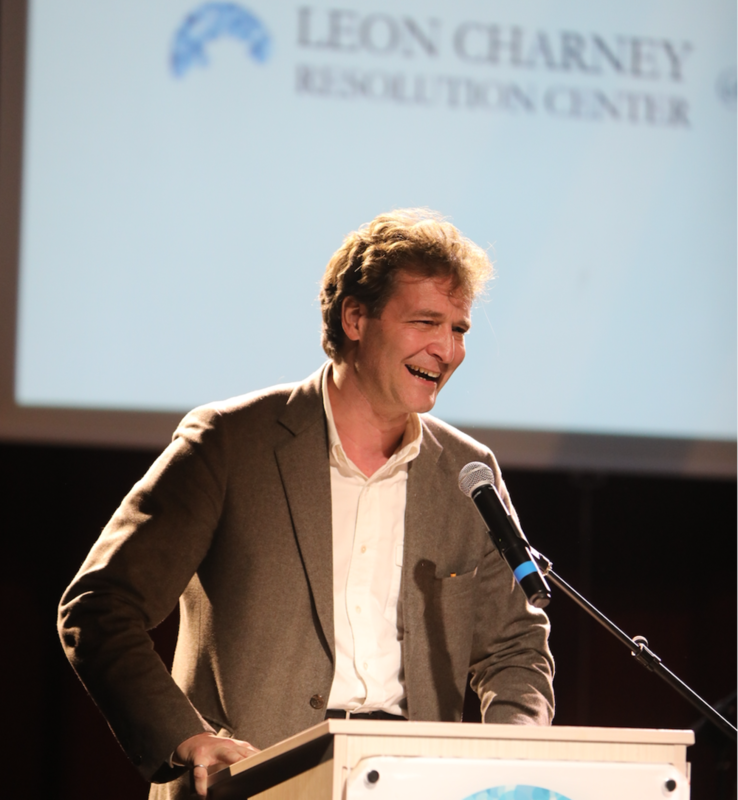 The event was initiated by longstanding University supporter Dr. Tzili Charney, founder of the Leon Charney Resolution Center in honor of her late husband Leon H. Charney. The Center aims to motivate individuals, especially the next generation, to pursue peaceful solutions by providing training in the art of negotiation and mediation. The student congress was held in cooperation with Minds of Peace. L-R: Sapir Handelman (Research & Simulation Leader), Tzili Charney (Center Founder) and Ron Robin, President of the University of Haifa. Read more about it in the Jerusalem Post. Jerusalem Post: Israeli And Palestinian Students Signed Simulation 'Peace Agreement"
Tzili Charney, founder of The Leon Charney Resolution Center was part of the delegation of Anwar Sadat’s Congressional Gold Medal Commission on Tuesday, February 19th at the Presidential Palace in Cairo, Egypt. She engaged President Sisi in dialogue pertaining to the important mission of the Resolution Center and gave an overview of its various programs. Afterwords, she received some words of encouragement and appreciation from President Sisi about how important the center’s mission is and to continue its ongoing effort to reach regional peace. Sapir Handelman, CEO of the “Minds of Peace” organisation and negotiation moderator, met up with a group of EMIS students in order to prepare them for the annual Peace Simulation that will be taking place February 21st until February 22nd at the Leon Charney Resolution Center in HaKfar HaYarok, Israel. Throughout this meeting, he explained to them the structure of the simulation, what each stage of the debate is and what they would need to be doing throughout the entire event. Stay tuned to see what resolutions these students will come up with for peace!